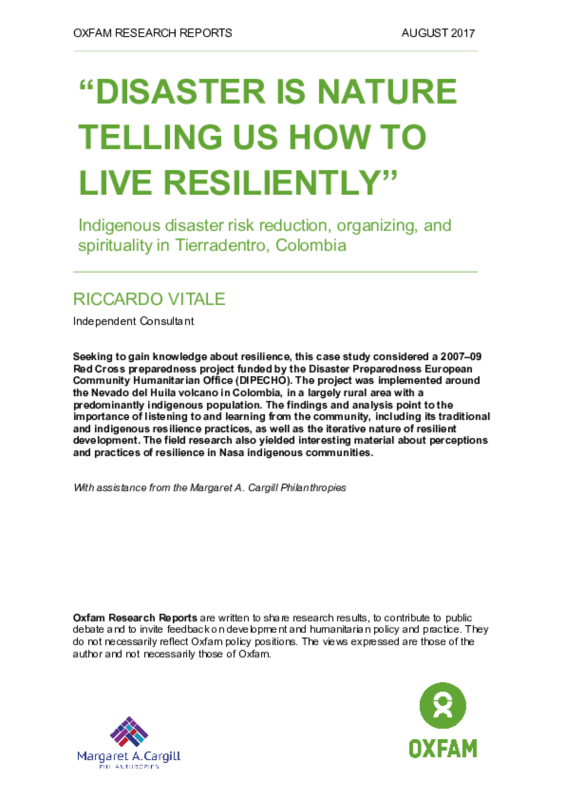 Seeking to gain knowledge about resilience, this case study considered a 2007-09 Red Cross preparedness project funded by the Disaster Preparedness European Community Humanitarian Office (DIPECHO). The project was implemented around the Nevado del Huila volcano in Colombia, in a largely rural area with a predominantly indigenous population. The findings and analysis point to the importance of listening to and learning from the community, including its traditional and indigenous resilience practices, as well as the iterative nature of resilient development. The field research also yielded interesting material about perceptions and practices of resilience in Nasa indigenous communities. This research was conducted with the support of the Margaret A. Cargill Philanthropies.